Protein integrity is a crucial charateristics for protein, as protein truncation or microheterogeneity can lead to malfunction of protein. It is even more critical for the quality tests of biopharmaceutical products, such as antibodies and vaccines. 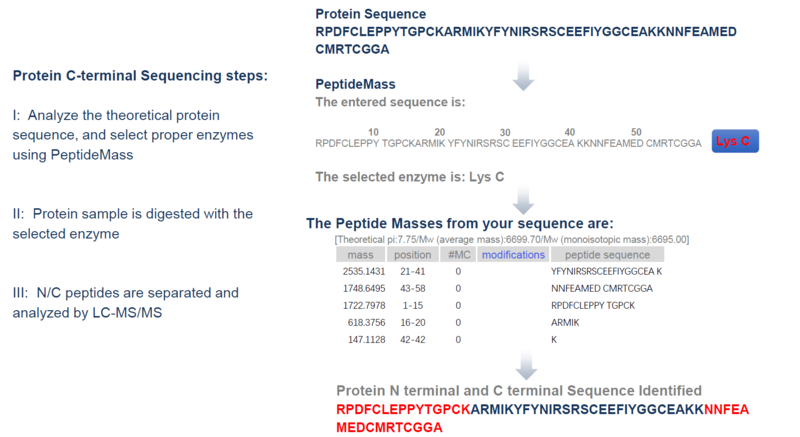 Thus, analysis of the C-terminal sequence of protein products is necessary for evaluating the quality and function of protein products. MtoZ Biolabs have developed a LC-MS/MS system, which is suitable for analyzing both N-terminal sequence and C-terminal amino acid sequence and PTMs. We strictly follow the ICH Q6B Guidance to fulfill our customers’ needs. Quantity	 Gel bands/spots that are visible to naked eyes are adequate for protein identification. For liquid samples, A total of 5-10 ug proteins are required.